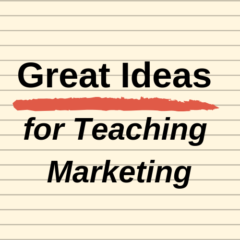 This third installment in the simulation game series offered on Great Ideas for Teaching Marketing, takes the student experience to a whole new level. This game is far more complex and is suitable for advanced undergraduate or postgraduate students, looking for a simulation game that covers most aspects of marketing strategy, consumer behavior, and competitiveness in the marketplace. If two products compete directly in the marketplace (with exactly the same positioning), then consumers will make their choice of which product to purchase based upon the combination of the above four factors. And depending upon which market segment that the team is targeting, each market segment will rate the importance of these four elements quite differently. As teams add to their product portfolios, by introducing new products for example, this will impact the overall market’s perception of the brand quality and brand clarity. This helps students understand that brands are interconnected entities that rely upon each of their products in the line playing a supportive role. However, a team can position a product appropriately to avoid competition – that is to be differentiated – and in this case they will essentially have no direct competition and will win sales in the marketplace as a result. Teams are also required to make price/margin decisions. This represents a significant trade-off, which helps students understand the importance of revenue management and profit goals rather than the pursuit of market share. Obviously, some market segments are quite price-sensitive and will win an increased market share for the team, but at a much lower margin – which may or may not be beneficial for their overall profitability. Therefore, as students play the game, they will soon realize that it is quite complex to make marketing decisions in the marketplace. Every decision may have an adverse or unintended outcome and their success depends upon effective management of their resources, the necessary trade-off between short-term and long-term goals, a trade-off between new product development and product improvement and repositioning, and an effective understanding of the competitors. This is why I would suggest this particular simulation game be run over an entire semester – even though it only runs eight rounds – because it would take probably a full class for students to get a good understanding of how the game operates – and this is even after that they have reviewed the video instructions. This is not to suggest that the simulation game is too difficult to understand – it is because there are so many “moving parts” to the market – just in real life. Therefore, they have a lot of decisions to think about and lots of choices of strategy and tactics. As the game unfolds, competitors will move perhaps unpredictably and levels of competitive rivalry are likely to increase. This further increases the complexity of each team’s decisions. As a rough guide, I would suggest that teams would need at least around an hour per around to make a decision – and longer if you are also trying to teach marketing analysis and metrics, in addition to teaching marketing strategy and the fundamentals of marketing concepts.